Just as pulmonary function tests are an important part of understanding the lung pathophysiology in nonmechanically ventilated patients, ventilator graphics are an important part of understanding the pathophysiology in mechanically ventilated patients. Ventilator graphics have the added advantage of not producing the noise from the oropharynx that occurs with routine pulmonary function tests, because the endotracheal tube bypasses the oropharynx. Also important is understanding that more than one asynchrony can be in play and that one form of asynchrony (primary) may subsequently lead to multiple other (secondary) asynchronies. Thus, carefully assessing the waveforms in a systematic fashion, akin to reading electrocardiographic (ECG) tracings, is critical in the analysis of these waveforms. Just as changing the gain and paper speed can help identify abnormalities in an ECG tracing, changing one or both of the axis scales may be important in identifying abnormalities that would otherwise be missed. The mechanical breath may be initiated by the patient (patient trigger) or as a function of time (time trigger). The two common types of triggering available are pressure and flow. Trigger asynchrony can occur with any mode of mechanical ventilation. Common trigger problems include autotriggering, missed triggering, and double triggering. Appropriate valve sensitivity settings are required to avoid overly sensitive settings that can lead to autotriggering and insufficiently sensitive settings that can lead to missed triggering. Mechanical ventilation can have a negative impact on the patient's respiratory drive, as shown by Kondili et al. Thus, increasing ventilatory support can be associated with ineffective triggering. The application of external PEEP has been shown to decrease ineffective triggering in patients with high auto-PEEP (see the image below). External PEEP in this setting reduces the work of breathing needed to trigger the ventilator. [15, 16, 17] Chao et al found that the most effective method for eliminating ineffective asynchrony in this setting was to reduce the level of ventilator support. They also demonstrated that the application of external PEEP reduced but did not eliminate ineffective triggering. The flow to time waveform demonstrating auto–positive end-expiratory pressure (auto-PEEP). The use of in-line nebulizers may lead to ineffective triggering during flow triggering because of the interference with base flow. Thus, use of pressure-trigger settings during nebulizer treatment or the use of ultrasonic nebulizers may avoid this problem. Increasing the inspiratory time or the tidal volumes may help with double triggering. If the patient has a variable respiratory drive, so that setting a flow on a fixed mode of flow delivery is not adequate, changing to a variable flow (eg, pressure-controlled ventilation [PCV]) or a dual-control mode may be helpful. Sedation adjustments may be necessary if all these measures fail. If the patient’s ventilatory need is high or has suddenly changed, it is important to determine the cause of this change (eg, stroke or pulmonary embolism) when making these adjustments. During the inspiratory phase, the presence of inappropriate flow and patterns can be identified through close inspection of the flow and pressure graphics. Flow may be inadequate or excessive, and either state may contribute to patient-ventilator asynchrony. It is important to realize that inappropriate flow rates and patterns may lead to a number of secondary asynchronies. For example, inappropriate flow may reduce the expiratory time, leading to auto-PEEP, which may lead to ineffective triggering. Evaluation of the inspiratory-phase asynchrony begins with identifying whether the flow is fixed or variable. Adequate flow is represented by a smooth, rounded initial part of the pressure graphic with a plateau on the latter half of the pressure curve. Inadequate flow can result in a significant increase in work of breathing. Inspection of the pressure and flow graphics show a "scooped-out" appearance of the pressure waveform and may also show increased flow in the direction of the flow if the patient’s effort draws in air through the demand valve. Inadequate flow rates may cause undue prolongation of the inspiratory time, leading to shortened expiratory times, which, in turn, may lead to auto-PEEP and ineffective triggering. 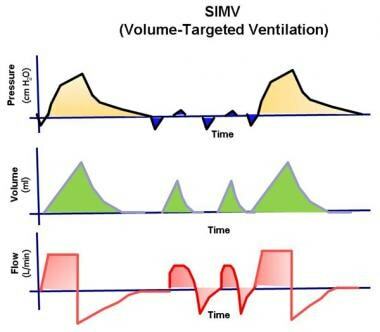 The pressure, volume, and flow to time waveforms for synchronized intermittent mandatory ventilation (SIMV). 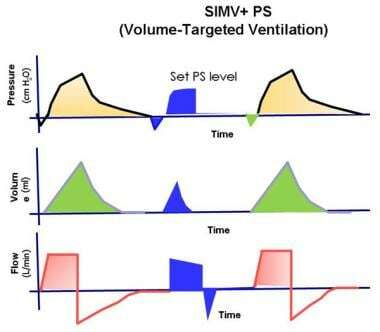 The pressure, volume, and flow to time waveforms for synchronized intermittent mandatory ventilation (SIMV) with pressure-support ventilation. Excessive flow can be identified on the pressure waveform by the presence of acute "takeoff" of the ascending limp of the pressure curve along with a pressure spike at the beginning of the curve. Sometimes, the presence of a continued strong inspiratory effort by the patient may give the illusion of excessive flow; however, close inspection of the ascending limb of the pressure curve would show a slow takeoff of the ascending limb, as opposed to the acute takeoff that would be expected with excessive flow rates. Certain patterns of flow are used in certain clinical situations. For example, in patients with chronic obstructive pulmonary disease, the descending-ramp flow pattern or variable flow associated with PCV has been shown to be preferable. [20, 21] However, care should be taken in switching between patterns, especially when prolonged expiratory times are required, because flow-pattern changes could be accompanied by a prolonging of inspiratory times with shortened expiratory times, resulting in auto-PEEP. During PCV, the flow is variable. 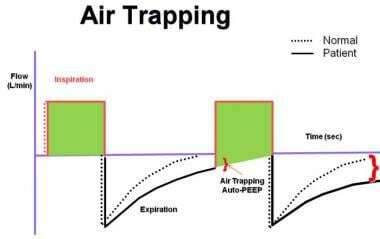 The flow depends on several variables, such as respiratory system compliance, set target pressure, and patient effort. When the rise time is adequate, the representative pressure waveform has a rounded front end and a plateau body. Excessive rise time appears as a pressure overshoot at the front end of the pressure-time waveform, and inadequate rise time appears as a concave beginning to the pressure-time waveform. Rapid rise times may be associated with premature breath termination and may lead to double triggering if the patient’s effort is sufficient to trigger a mechanical breath. Inadequate rise time, on the other hand, may lead to prolongation of inspiration, leading to neural asynchrony, and insufficient expiratory time, leading to auto-PEEP and even triggering asynchrony. This, again, is an example how a primary asynchrony may lead to multiple secondary asynchronies. The cycling between inspiration and expiration in ACV (see the image below) is a function of the preset inspiratory time and tidal volume. During pressure-control/pressure-support breathing, the cycling between inspiration and expiration is brought about by a drop in the flow rate and the breath cycles when the flow reaches a percentage of the peak flow. Other secondary cycling characteristics also are present as a safety precaution if the inspiratory time is unduly prolonged. 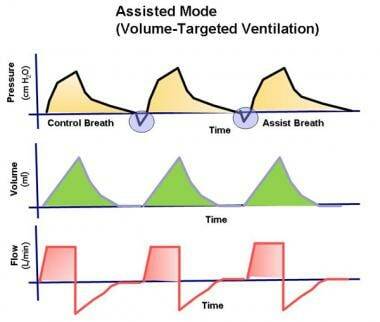 The pressure, volume, and flow to time waveforms for assist-control ventilation. During ACV, prolongation of the inspiratory breath into neural breath termination and expiration can lead to cycle asynchrony. Careful analysis of the pressure and flow curves reveals the presence of a spike at the terminal part of the pressure waveform and may show a "zero" flow in the flow waveform (eg, pressure-regulated volume control; see the image below) or a sudden decrease in the flow. This spike may also be identified in the pressure and volume curves. 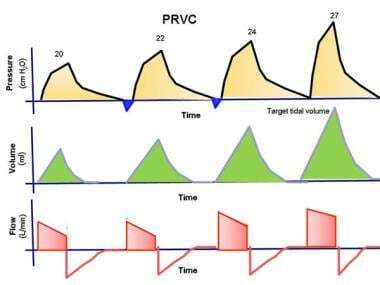 The pressure, volume, and flow to time waveforms for pressure-regulated volume-controlled ventilation. Overdistention of the lung with large tidal volumes may also show a similar pattern in the pressure-time curve and the pressure-volume curve, and differentiation from neural synchrony can be confusing. Adjusting the tidal volume or inspiratory time can facilitate differentiation between these two states. Shortened expiratory time may lead to auto-PEEP (see the image below). This can be seen in clinical conditions resulting in slow expiratory time constants (eg, COPD). In addition, as noted in the previous sections, it can result from other primary asynchronies and, by itself, can result in secondary asynchronies (eg, trigger asynchrony). Managing auto-PEEP includes correction of any asynchronies, as is described in previous sections, and treatment of the underlying clinical problems. Prabhakaran P, Sasser WC, Kalra Y, Rutledge C, Tofil NM. Ventilator graphics. Minerva Pediatr. 2016 Dec. 68 (6):456-469. [Medline]. Thille AW, Rodriguez P, Cabello B, Lellouche F, Brochard L. Patient-ventilator asynchrony during assisted mechanical ventilation. Intensive Care Med. 2006 Oct. 32 (10):1515-22. [Medline]. Ramirez II, Arellano DH, Adasme RS, Landeros JM, Salinas FA, Vargas AG, et al. Ability of ICU Health-Care Professionals to Identify Patient-Ventilator Asynchrony Using Waveform Analysis. Respir Care. 2017 Feb. 62 (2):144-149. [Medline]. [Full Text]. Sokhal N, Goyal K, Chowdhury T, Rath GP. See-saw pattern in ventilator graphic: Is there any story behind?. Niger Med J. 2014 Jul. 55 (4):359-61. [Medline]. Mellema MS. Ventilator waveforms. Top Companion Anim Med. 2013 Aug. 28 (3):112-23. [Medline]. Subirà C, de Haro C, Magrans R, Fernández R, Blanch L. Minimizing Asynchronies in Mechanical Ventilation: Current and Future Trends. Respir Care. 2018 Feb 27. [Medline]. Sassoon CS, Gruer SE. Characteristics of the ventilator pressure- and flow-trigger variables. Intensive Care Med. 1995 Feb. 21 (2):159-68. [Medline]. Richard JC, Carlucci A, Breton L, Langlais N, Jaber S, Maggiore S, et al. Bench testing of pressure support ventilation with three different generations of ventilators. Intensive Care Med. 2002 Aug. 28 (8):1049-57. [Medline]. Calzia E, Lindner KH, Stahl W, Martin A, Radermacher P, Georgieff M. Work of breathing, inspiratory flow response, and expiratory resistance during continuous positive airway pressure with the ventilators EVITA-2, EVITA-4 and SV 300. Intensive Care Med. 1998 Sep. 24 (9):931-8. [Medline]. Marjanovic NS, De Simone A, Jegou G, L'Her E. A new global and comprehensive model for ICU ventilator performances evaluation. Ann Intensive Care. 2017 Dec. 7 (1):68. [Medline]. [Full Text]. Imanaka H, Nishimura M, Takeuchi M, Kimball WR, Yahagi N, Kumon K. Autotriggering caused by cardiogenic oscillation during flow-triggered mechanical ventilation. Crit Care Med. 2000 Feb. 28 (2):402-7. [Medline]. Hill LL, Pearl RG. Flow triggering, pressure triggering, and autotriggering during mechanical ventilation. Crit Care Med. 2000 Feb. 28 (2):579-81. [Medline]. Kondili E, Prinianakis G, Georgopoulos D. Patient-ventilator interaction. Br J Anaesth. 2003 Jul. 91 (1):106-19. [Medline]. Nava S, Bruschi C, Rubini F, Palo A, Iotti G, Braschi A. Respiratory response and inspiratory effort during pressure support ventilation in COPD patients. Intensive Care Med. 1995 Nov. 21 (11):871-9. [Medline]. Smith TC, Marini JJ. Impact of PEEP on lung mechanics and work of breathing in severe airflow obstruction. J Appl Physiol (1985). 1988 Oct. 65 (4):1488-99. [Medline]. Mancebo J, Albaladejo P, Touchard D, Bak E, Subirana M, Lemaire F, et al. Airway occlusion pressure to titrate positive end-expiratory pressure in patients with dynamic hyperinflation. Anesthesiology. 2000 Jul. 93 (1):81-90. [Medline]. MacIntyre NR, Cheng KC, McConnell R. Applied PEEP during pressure support reduces the inspiratory threshold load of intrinsic PEEP. Chest. 1997 Jan. 111 (1):188-93. [Medline]. Chao DC, Scheinhorn DJ, Stearn-Hassenpflug M. Patient-ventilator trigger asynchrony in prolonged mechanical ventilation. Chest. 1997 Dec. 112 (6):1592-9. [Medline]. Acute Respiratory Distress Syndrome Network., Brower RG, Matthay MA, Morris A, Schoenfeld D, Thompson BT, et al. Ventilation with lower tidal volumes as compared with traditional tidal volumes for acute lung injury and the acute respiratory distress syndrome. N Engl J Med. 2000 May 4. 342 (18):1301-8. [Medline]. Georgopoulos D, Kondili E, Prinianakis G. How to set the ventilator in asthma. Monaldi Arch Chest Dis. 2000 Feb. 55 (1):74-83. [Medline]. Yang SC, Yang SP. Effects of inspiratory flow waveforms on lung mechanics, gas exchange, and respiratory metabolism in COPD patients during mechanical ventilation. Chest. 2002 Dec. 122 (6):2096-104. [Medline]. Bonmarchand G, Chevron V, Ménard JF, Girault C, Moritz-Berthelot F, Pasquis P, et al. Effects of pressure ramp slope values on the work of breathing during pressure support ventilation in restrictive patients. Crit Care Med. 1999 Apr. 27 (4):715-22. [Medline]. Tokioka H, Tanaka T, Ishizu T, Fukushima T, Iwaki T, Nakamura Y, et al. The effect of breath termination criterion on breathing patterns and the work of breathing during pressure support ventilation. Anesth Analg. 2001 Jan. 92 (1):161-5. [Medline]. The components of mechanical ventilation inflation pressures. Paw is airway pressure, PIP is peak airway pressure, Pplat is plateau pressure. Determination of the lower inflection point to estimate the best (optimal) positive end-expiratory pressure (PEEP) from the pressure-volume hysteresis curve. The effect of positive end-expiratory pressure (PEEP) on the pressure-time inflation curve.